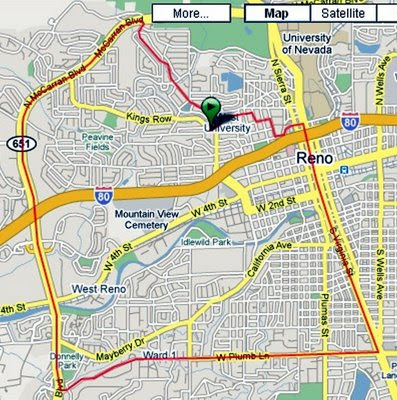 Running 'round Reno: Day 7 - Daylight run! Day 7 - Daylight run! I actually got to run in the daylight today, which meant that I started running at 6:00 instead of 4:00 or something. It was a PERFECT morning for running - high 50's, for once not threatening to rain - excellent long-sleeve shirt weather. Did my planned long run - 11.73 miles, it turned out. One of my "obvious" loops - staying to prtty big roads, not branching off too much. Kind of rhythmic there, during the week, huh? Hope to keep it about the same next week, with three shorter runs MWF and speed work Tu-Th. Relay up at Lake Tahoe on Saturday - not exactly sure which leg I'll be doing. but probably around 10 miles. That's what I was going for! 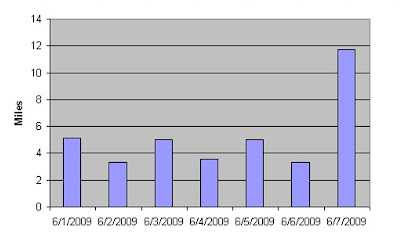 As I was running this week, I kept thinking "If I can just make one more mile, I'll have a nice tidy graph!" ;) to you too. Days 13 & 14 - Busy.